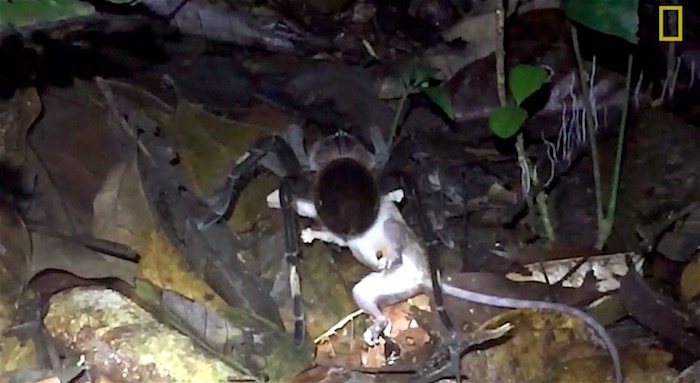 A team of scientists went to Peru's lowland tropical forest to document invertebrates and saw an uncommon sight: a large tarantula, the size of a "dinner plate" with "massive fangs" catching and eating a baby opossum. Although they didn't capture on video the part where the tarantula caught the animal, they were the first to ever record a tarantula feasting on an opossum. “When we do surveys at night, some of the spiders we see will have prey, typically other invertebrates like crickets and moths," said one of the scientists, Rudolf von May from the University of Michigan, according to National Geographic (click on the link to see a longer version of the video). But one night [the survey revealed a sight none of the researchers had seen before: A tarantula the size of a dinner plate preying upon a small opossum. "The opossum had already been grasped by the tarantula and was still struggling weakly at that point, but after about 30 seconds it stopped kicking,” co-author Michael Grundler, a Ph.D. student says in a statement. Later, Robert Voss, a mammologist at the American Museum of Natural History, confirmed they had captured the first documentation of a large mygalomorph spider—commonly known as a tarantula—hunting and eating an opossum. In a piece on octopus farming, Katherine Harmon mentions a fascinating fact — octopuses don't have an adaptive immune system, the handy-dandy network of different immune-response cells that allow us vertebrates to more easily fight off infections our bodies have encountered before. That's a problem if you're trying to raise a bunch of invertebrates in close quarters (as per a farm) because you can't immunize them against pathogens that could easily spread from one octopus to another. As a random biological tidbit, though, it's just damned fascinating. 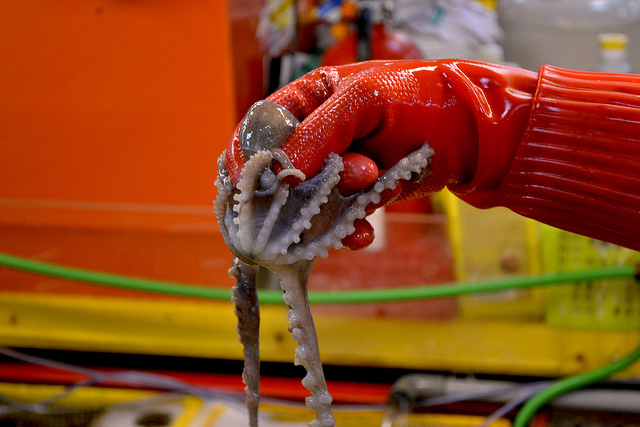 Check out this doctoral thesis for more information on how the octopus immune system does work. You should also read this story that looks at the evolution of the adaptive immune system and asks a key question — does having immune "memory" really make us that much better off than the animals that don't have it? When the octopus says, "ouch"
This is the second story in a four-part, weekly series on taxonomy and speciation. It's meant to help you as you participate in Armchair Taxonomist — a challenge from the Encyclopedia of Life to bring scientific descriptions of animals, plants, and other living things out from behind paywalls and onto the Internet. Participants can earn cool prizes, so be sure to check it out! On the sixth floor of New York's American Museum of Natural History — far away from the throngs of tourists and packs of schoolkids — there is a cold, white room, filled with white, metal cabinets. The cabinets are full of dead things; leeches, sea anemones, lobsters ... any kind of invertebrate you can imagine. Even a giant squid. All of them have been carefully preserved. Each soaks in its own, luxuriant ethanol bath. Here they sit, some for a hundred years or more, waiting for scientists to pull them out into the light. Say you're a marine biologist and you want to study the little bitty creatures of the sea — shrimps and worms and things like that. How do you go about capturing them? 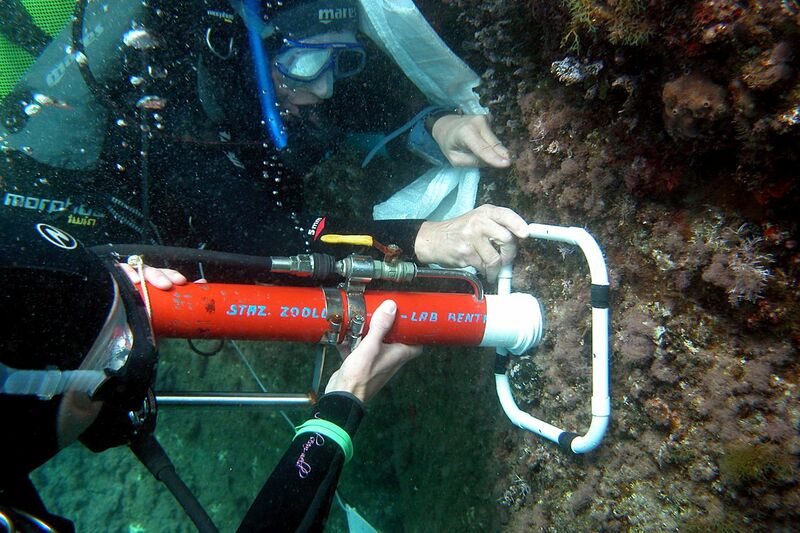 Why, with an underwater vacuum, of course. How's this for an amusing case of photographic mis-identification? Call it "Dueling Disgustingness". Last week, New Scientist posted this lovely image of a blue-spotted sea urchin, taken by nature photographer David Fleetham. New Scientist identified the photo as depicting said sea urchin in the process of expelling its own guts out of its mouth. Which, gross, but okay. That's reasonable. A surprising number of underwater animals eat in this manner, using the acids in their guts to dissolve prey before they actually slurp it up as a slurry. 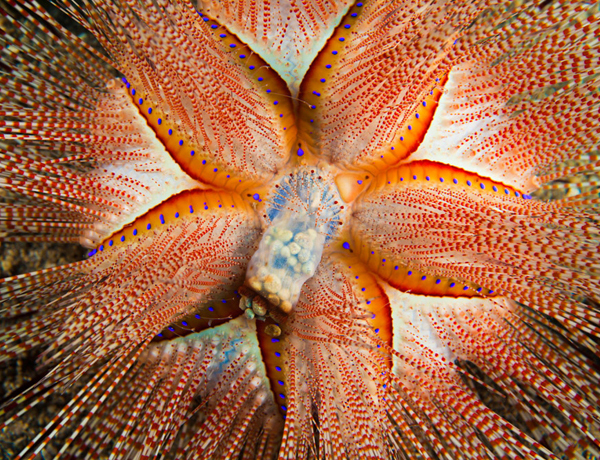 But, at the Echinoblog, Smithsonian invertebrate zoology researcher Christopher Mah makes a compelling case against New Scientist's interpretation. That's not actually the sea urchin's mouth, says Mah. In fact, it's the opposite. That's a (rare) photo of a sea urchin taking a dump. Mah has a lot of good photos that make his case quite well. You should check them out. Then, join me in contemplating this thought: If Mah is right, doesn't sea urchin poop look a lot like Dippin' Dots? Christopher Mah's analysis of the photo, explaining why he thinks it shows a pooping sea urchin, rather than one that is eating something. Tool-using animals: Now with 100% more invertebrates! Warning: This video contains footage of an octopus hiding under a coconut shell that it has carried around just in case it needed to hide from something. Watching this footage may contradict your previous assumptions about animal tool use, and may be too adorable for some viewers.